Much of the race was a freight train consisting of Dovisioso, Marquez, Petrucci, and Rins. 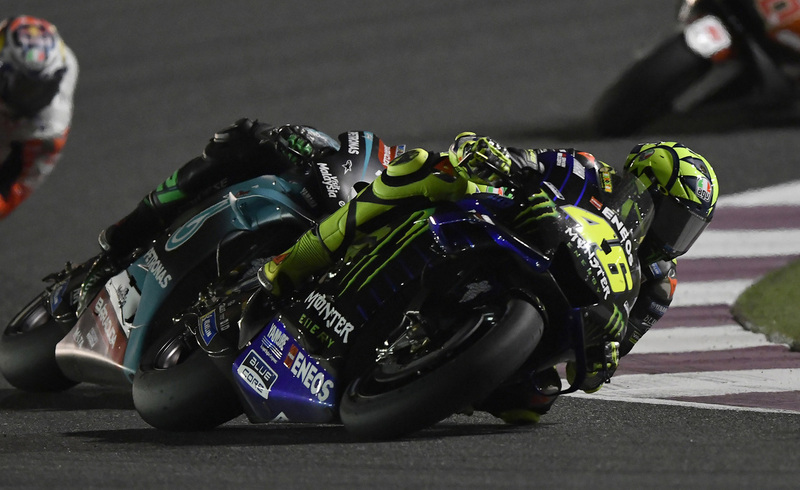 The weirdest thing about the weekend – and a vivid reminder for us not to pay too much attention to the goings-on in the Persian Gulf – is that Rossi topped the timesheets in FP1 before going on a mini-vacation until the red lights went out. 17th in FP2. Fourth in FP3. 18th in FP4. Fourth again in Q1. 11th in the morning warm-up. He then went out and passed eight riders during the race, showing once again that he is the epitome of the Sunday rider, the Alan Iverson of MotoGP. “Practice? We don’ need no steenkin’ PRACTICE.” Vinales, to the contrary, was the bomb diggity in practice before going out and laying another egg for the first 16 laps or so. But 5th, 7th, 11th (Franco Morbidelli) and 20th (Hafizh Syahrin) suggests Yamaha has not answered many of the questions facing them at the end of last season. Over in Hondaland, Marquez was fast all weekend but not laser rocket fast; Losail is still one of his least favorite tracks. 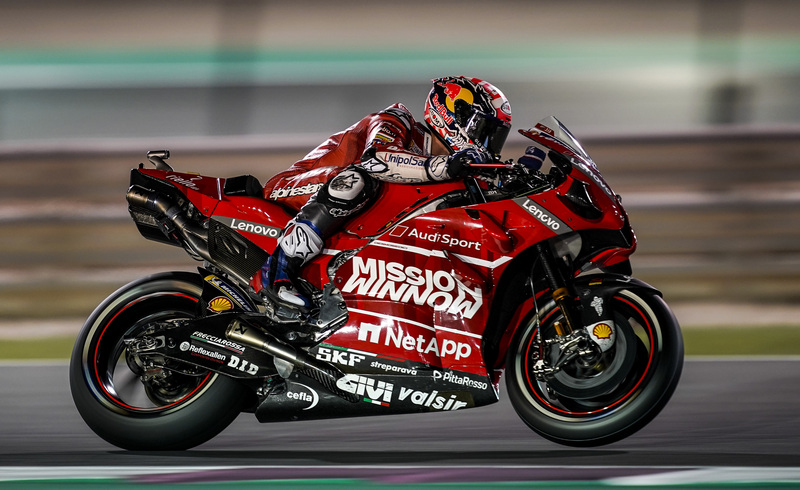 New teammate Jorge Lorenzo experienced his first Honda high-side on Saturday morning, complaining afterwards that he hurt “everywhere.” He recovered enough to put in a credible performance in Q1, leading the way into Q2 until he folded the front with three minutes left in the session. During those last three minutes – the best racing of most weekends – he was forced to stand by and watch as the LCR Honda duo of Crutchlow and a rejuvenated Takaa Nakagami, rookie Pecco Bagnaia, and old buddy Rossi slipped in front of him. Rossi, Lorenzo, and Bagnaia ended up constituting possibly the strongest fifth row in MotoGP history. Rossi’s on and off weekend culminated with a march from 14th on the grid to a strong 5th place finish. Anyone interested in picking up an expansive array of French invective need only speak to Johann Zarco, who, regrettably, made the move from Yamaha to KTM last year. An indicator of the quality of that particular decision may be found in the fact that he started last year’s race from pole and this year from 18th place. Unlike last year, where he finished 5th, he finished the race, earning only one (1) championship point for his efforts. His preseason pronouncement that he expected to fight in the top five this season begs the question: “In Moto2 or Moto3?” KTM’s MotoGP project is, to put it mildly, behind schedule. Ask any of their four riders, all of whom must be grinding their molars to dust trying to generate any results from the RC16. The Dorna PR machine is pumping out release after release these days claiming, without corroboration, that MotoGP is the best racing on the planet. And although I wouldn’t disagree, most of the other 8 billion inhabitants thereof might take issue with the assertion, having never seen a motorcycle race. Certainly, in the U.S. MotoGP ranks right up there with women’s curling and caber tossing. But for those of us who follow it, the sport appears never to have been better. Much has been made during the offseason about Ducati’s mysterious “holeshot handle” which appeared below the dashboard on the GP19 and is alleged to minimize wheelies at the start. It appeared to work for Dovizioso, who led into Turn 1 from second on the grid, but not for Petrucci – whose starts was less than stellar. Jack Miller, who apparently longs for the bygone “Jackass” days, was experiencing some kind of difficulty early in the race, traced the problem to his seat cushion, and summarily removed it and dropped it into the middle of the mass of riders hot on his tail, somehow skirting disaster. The nicest term Steve Day could come up with to describe Miller’s faux pas was “random.” Jack may hear from Race Direction prior to the Argentina junket. Andrea Dovizioso spent all but a few seconds here and there out in front of the pack. For the most part, Dovizioso led the entire race. There were a few moments here and there when Rins or Marquez would nose in front of him, only to get blasted by the wake of his Desmosedici when it hit the top of the main straight, morphed into an F-16 fighter jet at very low altitude, and re-took the lead into Turn 1, time and time again. Raw speed in MotoGP is like height in the NBA in that it is necessary but not sufficient. 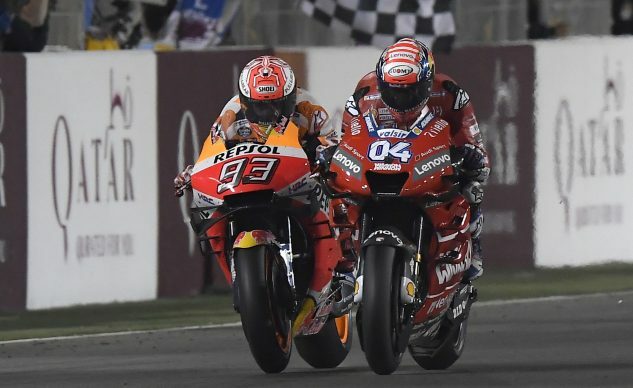 The speed of the Ducati in conjunction with the skill and experience of Andrea Dovizioso would likely dominate MotoGP were it not for the genius of Marc Marquez and his unruly Honda RC213V. The Honda is faster this year than last, and Marquez will, with two intact shoulders, be better than last year. If #93 suddenly washed his hands of MotoGP and took up fly fishing, Dovizioso could easily win a couple of titles. But there is little reason to expect either. Cal Crutchlow defied the odds to claim the third step on the podium. French rookie Fabio Quartararo was the talk of the weekend. He put his Petronas SRT Yamaha surprisingly high on the timesheets on Friday and Saturday, qualified for Q2, and started, or, rather, was scheduled to start the race, in the middle of the second row. The talk turned to sputtering gibberish when he stalled at the start of the warm-up lap, forcing him to start the race from pit lane on ice-cold tires. Having lost a full ten seconds as a result, he finished only 15-some seconds behind Dovizioso, a most impressive recovery. The top rookie of the day, however, was my boy Joan Mir on the #2 Suzuki who spent the day flirting with a podium before finally showing some respect and finishing 8th. Pecco Bagnaia, my dark horse earlier in the week, entered Turn 1 on Lap 13 at about a zillion miles an hour and rode almost through the gravel trap, needing a ticket to re-enter the fray. Alas, the race was a sellout, and his day ended early. (Prior to his going walky he was, sadly, not a podium threat.) Let me just say this out loud – the two Suzuki riders, Rins and Mir, are going to give second-tier riders some headaches this season. Mir, in fact, is probably the better of the two. Memo to Suzuki: GIVE THESE GUYS MORE HORSEPOWER NEXT YEAR! They have mad skills. Fabio Quartararo surprised with his second row qualification and by finishing just out of the points after starting from the box – with a 10 second deficit. We are not going to bother re-ranking the riders based upon Qatar. As we’ve seen in years past, it is a true outlier, and results here are not indicative of anything in other than broad strokes. Never fear, however – I’m already working on the post-Rio Hondo standings, he lied. Today, in my real life, was a perfect storm, leaving little time or mental energy for MotoGP. But March 31st will be different. Informative. Rib-tickling. Incisive. And on time.